Welcome to my stop on the Hero Arts 2016 Winter Catalog Blog Hop! 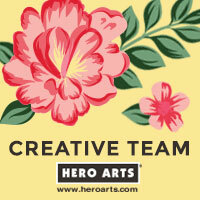 Today we are celebrating the arrival of all these fabulous new products in the Hero Arts Online Store. I'm using three new products on my card today -- the Grateful Leaves stamp set, the Ombré Autumn Ink Pad and the Tag Infinity Dies. First, I die cut the tag from some Sizzix Leather Paper and stamped the leaves using the Autumn Ombré ink. These ink colors are perfect for fall leaves and the texture from the paper really makes the leaves realistic! I added a white heat embossed sentiment to the tag, which is also from the Grateful Leaves stamp set. And for the subtle tone-on-tone background I stamped some of the leaf images with VersaMark ink on a kraft card base. I finished off the card with a scattering of Hero Arts Mixed Accents, which coordinate perfectly with the colors of the leaves. I just love the mix of gems and pearls together! Hero Arts will be giving away three $25 shopping sprees, drawn from comments left across all blogs in the hop. Please comment by Sunday, August 28 at 11:59pm PT and they will announce the winner the following week. beautiful cards -- the layout is wonderful, and the leaves are so pretty!!! I love the fall leaves!!! So, so enjoying the hop! Gorgeous and organic images with beautiful colour! Love the leaves on the tag. Pretty card. I love fall cards and your use of tags! Beautiful fall leaves and awesome card design. I must give the leather paper a try. I also love the ombré ink for the leaves. How easy is that? A beautiful card. Thanks! I love that leaf stamp and die set... so perfect for fall/ thanksgiving cards... or spring, if done in greens! Beautiful card! Love the design and colors. Wow, stunning. Loving that ombre ink. Thanks for sharing. Leather paper is different idea! Well, thank you for using these gorgeous leaves. I was hoping to see them along the hop somewhere. Very pretty. Thanks for the inspiration. Such a beautiful card, Kelly! I just adore your leafy tag and the wonderful fall colors! Such a beautiful design! Thanks for sharing! Great fall tags, Kelly! Beautiful stamp set! loved the color of ink you used. As you said so perfect. So ready for fall, so this card was perfect to get me in the mood. Love the leaves and the color combination on your card. Thanks for sharing. I love fall cards and colors and yours is gorgeous! Great design! Your autumn leaves are gorgeous. Well done. Nice change of pace to autumn. Lovely. I just love the fall colors! And I can't wait to try the leather paper. Beautiful fall leaves and I like the leather paper you used. Simple yet oh so SPECTACULAR! Great job! TFS! This looks amazing! Love the colors of the leaves. I'm so ready for fall and this card makes me happy. I love the fall colors and this stamp set is great. I must try that Ombre Autumn ink pad. It is gorgeous. Oh what a lovely fall card. Love this set and the colors you used. Great cards. Love the warm, rich colors of the leaves! So beautiful for autumn. I love fall colors and the autumn leaves are just gorgeous. Thanks for sharing. Very Pretty! Love your leaves! I love the colors of fall and autumn leaves are just beautiful. Thank you for sharing your talent with us. Love your card, especially the color of the leaves! Autumn is my favorite season and what you did with the leaves and Kraft paper makes me so happy! Love the leaves on the tag. STUNNING card. Love your card and the colors used. This card is beautiful, and perfect for Thanksgiving! Beautiful fall tag card. Love the faux stitching. This is adorable!! I love the use of the autumn leaves on a tag on the card. Beautiful! Those leaves look amazing! Love that kraft and your tag on it is gorgeous! I'm not quite ready for winter so it was nice that you got me in the mood with a fall tag. The use of the ombre inks turned out gorgeous on your leaves! Pretty. Love that the background only goes halfway, and that it ends on a diagonal. So cool! I just love fall and the leaves are gorgeous! Can't wait for fall to arrive...beautiful ideas. I plan to get the grateful Leaves stamp set and copy your card....beautiful. Thank you. Gorgeous card and beautiful stamping! I just love the new Ombre Autumn ink, your leaves are stunning!! Anxious to try out the new goodies I've ordered. Great fall card/tag with the autumn leaves. Thanks for sharing. The texture on the paper DID work beautifully with the leaves! I love the card design. I make thanksgiving cards and this layout would be great with a thanksgiving sentiment. Thanks for sharing! Love the fall colors and details added to your card! What a beautiful tag card, Kelly - just love your colorful fall leaves!! love love the card and that autumn leaves stamps set - definitely on my list of "must have"!! the contrasts on this card really make it pop. excellent! Perfect for Thanksgiving a holiday that often gets lost in the hubbub of Christmas. Love the leaves!! Gorgeous color! The leaves are so beautifil! Beautiful fall card. The leaf colors are gorgeous! Love the leaves. Very pretty card. Love the white embossing -- must remember this. I just ordered this die and stamp set thanks for giving me another way to use them. Thank you for using this new set. I was curious about it and I can see from your lovely card that it's beautiful. Wonderful card. I love the watermarked background. Thanks for sharing! The leaves are very lovely. Beautiful card! Love the colors & the fun layout. Thanks! Beautiful card highlighting one of my favorite times of the year. I love the tag you added with the leaves. Such a pretty fall card. Fantastic fall card. Such warm, delightful colors. Thanks for sharing. Your leaves are soooo pretty! Love this one. Darling card! Love the Fall coloring. Love the tone on tone and the diagonal bottom section of the card and the stamping of the leaves on the tag is so pretty! Nice card. Love the layout. One of the things I love most about fall is the fall colors,and this card has them all. So pretty! What a great idea to use the ombré ink for the leaves! Perfect fall colour. Your card is lovely. This Kraft card with the tag is fabulous! Your card is really great, giving ideas for many occasions ! As soon as I saw the autumn ombre ink, I knew I wanted to use it with the autumn leaves! Yours looks great! Oh how I love fall and you have pleased me with these beautiful leaves, love the ombre coloring of the leaves and your layout of the card is wonderful. Thanks for sharing! So pretty! That ombre ink pad is so cool. Love the beautiful colors in this card... Perfect !! I really like your fall card - I love all the colors you can combine for the leaves and still keep them realistic. Love the card! Very elegant! This is just a fantastic creation, great fall leaves! Love the details with the pearls and other bling. It's not overwhelming--just right! I love the design and tone on tone of your fall card. Thank you! What a lovely job ! Wonderful fall card. Very nice! Kelly this is awesome. Love the colours. Love your tags and the colors you used. Thank you for sharing with us. The stamped leaves are really st off by the Kraft cardstock. Your Fall leaves are gorgeous! I must get some of the new ombre inks! Gorgeous autumn leaves! Love your card! Great card with that leather paper! So nice to see a Fall card. Beautiful card-- the Grateful Leaves stamp set is on my wishlist! Your leaves are just gorgeous and I love the idea of using a tag to embellish a card. Thanks for sharing your ideas! Beautiful autumn card - love it. Just look at those pretty fall leaves, wonderful! Autumn surprise. Love the tag. I absolutely love these leaves! The colors are so warm and toasty. I'm so glad fall is right around the corner and this tag is really gorgeous! Love both the stamp set and the ink pad. The card is lovely and showcases the products so well! Love this fall leaf set. Beautiful card. Wow!!!! Beautiful card! I love the fall leaves and the colours you used!!! What a beautiful fall card I just love it. I love the way you use the leaves in this card. Great colors!! I'm so not ready for fall but your designs and colors makes it easier to get used too!! Love the color of the leaves! What a beautiful fall card, ty! Wow those fall leaves are scrumptious!! This layering fall stamp set is my new favorite for Fall and your card is so beautiful and lovely. THANK YOU for the inspirations! Kelly, that is absolutely beautiful! I must try this myself. Fall time has such pretty card images. Love the look of 'kraft' and a hint of color! I love the look of kraft paper on fall cards! So beautiful! That hombre ink is PERFECT for the leaves! Such beautiful leaves and on kraft - love them!! You are so right - that fall ombre ink is Perfect for those leaves! Thanks for sharing! Love the leaves and how you attached the tag! So pretty! Love the fall colors together with gold accents. Gorgeous effect on kraft card! Love that new Autumn ombre ink pad! Your colors are beautiful. Thanks for sharing on the blog hop. Happy to see some Autumn! My favorite. Love the look of the ombre leaves on the leather paper....very cool! So much new stuff to love - autumn ombre (perfection!) and the mixed accents are such a good idea. I bought the leaves and ombre ink today! Can't wait to make Thanksgiving cards. TFS!! Love the leaves using the ombre ink pad. Thanks for the inspiration. Beautiful card, love the ombré ink pad leaves, sooo very pretty! Love your card - the leaves are just gorgeous. The tag would be great for a fall dinner place card. The colors are vibrant and beautiful. Thank you for showing us your art. Also to Hero arts for the exciting release. Love how you coloured the leaves. I love the way you used the leaves for a background and focal point both. Beautiful colors and design. Awesome design, love how you stamped the leaves. Love the color on those amazing leaves! I love this card. I have planned a couple of Christmas cards that will have tags on. the look is great and the recipient can use the tag, if they want. Thanks. Beautiful card... love both the inked fall leaves (MUST HAVE that Autumn ombre ink pad!) and the watermark leaves in the background. Just lovely. Very beautiful card ! Those leaves seem so real, it is just incredible ! It's hard to believe that in a few months I will have to rid the garden of these leaves ! Thanks so much for sharing and for the chance to win. So pretty! I love the fall colors! Great card. I love the fall colors and the use of a tag. Your card turned out beautifully. Really lovely coloring. The leaves look so realistic. Gorgeous autumn card! Love the coloring on the tag! Thanks for sharing! Those leaves are so gorgeous! Fall is my favorite time of year. I think the fall ombre ink is my new fave! Beautiful tag! Very colorful for fall! Stunning tag, love your fall colors! Although it is sad to summer go, I do love the fall season. Loads of oranges and yellows. Love the background stamp, especially on kraft. Thanks for hopping and for a chance to win. The kraft card makes a wonderful background for that lovely tag. Whats not to love about fall leaves? Yours are Gorgeous! My favorite thing to color! TFS! Love your tag card good for fall or thanksgiving.